Kansas coach Bill Self revealed on Thursday that big man Cliff Alexander has been banged up, but that nagging back and chest problems shouldn’t keep him from playing at a high level as the Jayhawks enter the home stretch. While Alexander has started the last few games, Self has felt more comfortable with the more experienced Landen Lucas for most of the game and the redshirt freshman affirmed his coach’s faith with solid production against Baylor and West Virginia. How Self manages his frontcourt rotation is likely to continue to be newsworthy tomorrow when the Jayhawks square off against TCU. Burnt Orange Nation has a thorough preview of the best match-up of the weekend, which pits Texas against visiting Iowa State. The Cyclones, known for converting most every close shot they get, will face a Texas frontcourt that has improved since struggling in December and January. Despite a disappointing campaign to this point, there isn’t much reason to fret over the Longhorns’ chances of making the NCAA Tournament quite yet, but a loss would spark a heightened level of debate, so a win would definitely keep their heads above water. Meanwhile, the Cyclones, who had struggled on the road before beating Oklahoma State earlier in the week, will try to keep the good vibes going. With five games remaining to make up one game on conference-leading Kansas, history is still in Iowa State’s sights. They will need some help, but any help they get will be moot if they don’t take care of business themselves. As for Iowa State’s gameplan, the Longhorns have the ninth-best transition defense in the country according to hoop-math.com, so if Fred Hoiberg’s team is going to pull off another upset, it will probably have to be on the efficiency of its half-court offense. Thursday afternoon saw craziness ensue during the NBA trade deadline, and there were a couple interesting developments for former Big 12 standouts. The headline-grabber is a mini-reunion of the memorable 2006-07 Texas Longhorns with D.J. Augustin and Kevin Durant once again joining forces as Augustin was dealt from the Pistons to Durant’s Thunder. On a less pleasant note, former Jayhawk Thomas Robinson, who has struggled to find a permanent home at the next level, is on the move again after he was dealt from the Trail Blazers to the Nuggets. Robinson has already reportedly agreed to a buyout with Denver, though, so it looks like he’ll be on the move again as he searches for a role more befitting of a former #5 overall draft pick. Lastly, it’s been a very up-and-down month for Oklahoma State, which rode a wave of stellar victories before running into bumps in the road against TCU and Iowa State. Refusing to let the inconsistent play be a source of frustration, the Cowboy blog Pistols Firing brought some levity to the situation with some good old-fashioned satire at the expense of the team’s coaching staff. The post re-imagines coach Travis Ford as a “Breakfast Club”-type principal with assistant coach James Dickey playing the good cop role. It’s definitely worth a read. Bennet Hayes (@HoopsTraveler) is a national columnist. Tweets that end with a hashtag of “#RockChalk” are not hard to find in the Twitterverse, but one in particular had to bring a smile to the face of Bill Self and Kansas fans everywhere on Tuesday. 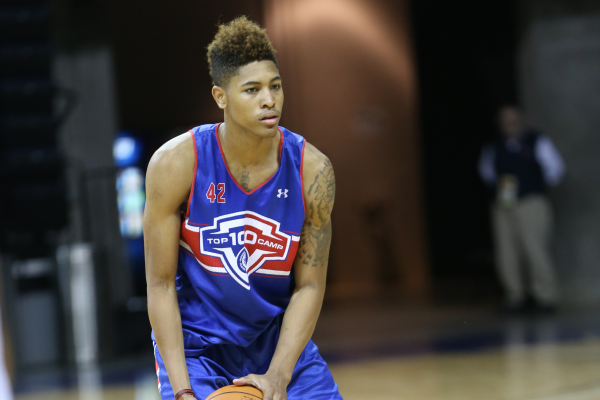 Kelly Oubre, one of the top prospects in the prep class of 2014, announced his commitment to Self and KU yesterday morning via social media. The Findlay Prep (NV) wing, who now looms as the natural replacement on the wing for presumptive one-and-done Jayhawk freshman Andrew Wiggins, is another huge get for several reasons. Oubre (#10 in RSCI’s summer rankings for the class of 2014) is a significant coup for Self, a coach whose recruiting efforts – at least in terms of the star power at the top of the rankings – haven’t always matched up with the prodigious success his teams have enjoyed on the court. This isn’t to say the Jayhawks have been winning multiple Big 12 titles and making Final Fours with two-star recruits from western Kansas, but with the Wiggins/Wayne Selden/Joel Embiid class now on campus and this commitment from Oubre for next season also in the books, Self and Kansas should be taken more seriously than ever as major players in the recruitment of the nation’s top prospects. According to RSCI Hoops, prior to this year’s incoming class, Kansas had landed just two consensus top-20 recruits (Xavier Henry and Josh Selby) since 2007. 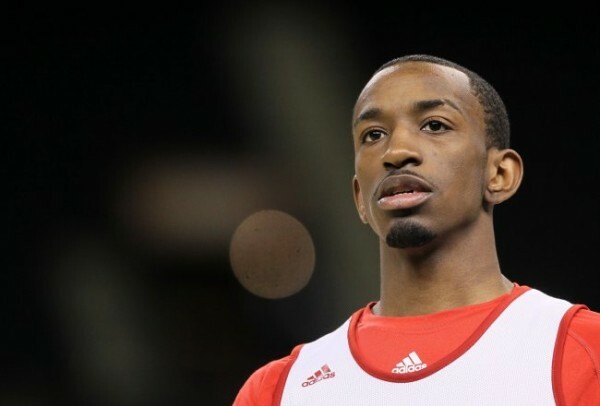 Of course, that number may as well have been one, as class of 2010 guard Selby never realized the potential he flashed during his high school days, averaging only 7.9 PPG in one disappointing season in Lawrence. For an interesting frame of reference, intrastate rival Kansas State — a program with nowhere near the hardwood history as KU — has recruited just as many top-20 players in that span. For (mostly) better or worse, Self simply hasn’t chosen to draw from that group of elite talents as often as the other national programs — granted, part of the reason for that may be some light reluctance on the side of the blue-chippers — but he has seemed pretty comfortable building winning teams without so many prep superstars dotting his roster. We continue the Sweet Sixteen tonight with games from the South Region in Arlington, Texas, and the Midwest Region in Indianapolis. Here are the breakdowns for tonight’s games. The Midwest Regional descends on Indianapolis this weekend, with Louisville and Oregon kicking off the action in a matchup of red-hot teams. If not for Florida Gulf Coast’s otherworldly Tournament performance last week, we would likely be looking at the two most impressive teams of the first weekend. As the top overall seed in the Tournament, Louisville’s tour de force in Lexington may not have been unexpected, but it did drive home the notion that the Cardinals are still the team to beat – in this region, and beyond. On the flip side, Oregon’s pair of resounding victories were not expected (despite getting significant play as the most underseeded team in the field on Selection Sunday), but have quickly afforded the surging Ducks a lot of respect. They will head into a virtual road game as massive underdogs on Friday, but the last two weeks have proven that this is a talented and tough basketball team. Do not expect Oregon to struggle with the aggressive Louisville defense as much as North Carolina A&T and Colorado State did. A quick briefing of the Oregon statistical profile may suggest otherwise – the Ducks are 264th nationally in turnover percentage – but that number is a bit misleading. For one, quick tempo teams are generally going to turn the ball over more, and Oregon plays fast (48th nationally in possessions per game). Also remember that starting PG Dominic Artis (I know, I know — how could we forget at this point?) missed more than half the Pac-12 season, and that backup PG Johnathan Loyd is just now beginning to hit his stride. These two guards will come as close to replicating the quickness and athleticism of that Louisville Siva-Smith combo as any duo the Cardinals have seen all season. Throw in athletes almost everywhere else on the floor – Emory and Dotson on the wings, Kazemi and Woods in the post – and there can be reasonable expectation that Oregon might actually be able to weather the turnover storm that has felled many Louisville foes. If Oregon can manage that turnover battle, expect this to be a 40-minute game. Points will not come easily for the Cardinals against a well-school (and athletic) Oregon defense, and the Ducks are also a better rebounding team — at least on paper. Dana Altman’s X-factor will be the burgeoning freshman Dotson. If Dotson and others – here’s looking at you EJ Singler — can replicate the three point barrage that undid Saint Louis, Altman’s group has a legitimate change to swing the upset. Too much to ask for? Probably. This is not your typical #12 seed (how is Oregon a #12 seed again? ), but they have run into a #1 seed that is playing its role all too well. I expect Oregon to prove a worthy challenger in all facets – managing turnovers, defending the dynamic Louisville backcourt, finding ways to score themselves – but ultimately they run into a team that is just a little better across the board. The Ducks will hang around, but Louisville should be safely bound for the Elite Eight. The last time Michigan advanced this deep into the NCAA Tournament was all the way back in 1994 with the Fab Five coached by current San Diego State head coach Steve Fisher. Ranked in the Top 10 for much of the season, John Beilein’s team certainly won’t be content just advancing to the second weekend; it is Atlanta or bust for the young Wolverines. To advance to Sunday’s South Regional Final, they will have to knock off a team with a wealth of NCAA Tournament experience in the Kansas Jayhawks. Kansas advanced to the championship game last season losing to Kentucky, but are missing two key components of that squad—Thomas Robinson and Tyshawn Taylor. While Bill Self has led Kansas to another very successful season—a Big 12 regular season and tournament championship and 30+ wins for the fourth straight year—this edition of Kansas basketball is lacking a rock-solid point guard and dominant scorer. One could certainly make the argument that freshman Ben McLemore is that scorer, but he has largely been a no-show in Kansas’ first two games scoring just 13 points on 2-14 shooting from the field. The combination of Elijah Johnson and Naadir Tharpe at point guard has dished out 11 assists to ten turnovers. Nobody will argue their frontcourt dominance anchored by the defensive prowess of Jeff Withey, but seniors Kevin Young and Travis Releford are prototypical role players and not go-to threats. As such, when looking up and down the roster, this has been yet another good coaching job by Bill Self. If Kansas is to defeat Michigan and advance to Atlanta, Ben McLemore must play up to his Top 5 NBA Draft pick ability. Kansas’ most glaring weakness happens to be Michigan’s clear strength: point guard play. This game will be decided in the backcourt, and Trey Burke along with Tim Hardaway Jr. are simply playing much better basketball than Elijah Johnson and Ben McLemore. Also, let’s not forget the emergence of freshman Mitch McGary who has stepped up in a big way with Jordan Morgan’s nagging ankle injury. Morgan may return to the regular rotation tonight, but he is just 6’8” and would struggle handling Jeff Withey on the insdie. John Beilein doesn’t expect McGary to have a double-double kind of game like he had against Virginia Commonwealth, but if he is able to neutralize Withey then it is mission accomplished. Kansas would be the first one to tell you that they played just 20 good minutes of basketball in their first two games. If they get off to another slow start out of the gate like they did against Western Kentucky and North Carolina, they’ll be hard-pressed to climb their way back into the game. Billy Gillispie is long gone from Texas Tech, and it’s doubtful his name will ever arise again in Big 12 circles for as long as he’s alive. And yet he’s still having an enormous impact on our game, even as he sits at home without a head coaching job. As CBS’ Gary Parrish astutely points out, Gillispie is almost solely responsible for the new preseason tournament formats in college basketball. After his Kentucky team lost to Gardner-Webb in the regional site of the 2K Sports Classic at Rupp Arena, GWU advanced to Madison Square Garden and left thousands of UK fans scrambling to cancel flights and sell tickets. Since then, only the Preseason NIT Tip-Off has kept the old format– you know, the one where the team that actually wins advances to the Garden. Parrish interviewed Delaware coach Monte Ross about his team’s experience in the Garden after knocking off Virginia in Charlottesville, and you’d be hard-pressed to find anybody who thinks his squad didn’t deserve to make the trip to NYC this year. Tickets and flights be damned. Speaking of New York City and that NIT Tip-Off, there’s a biggie tonight at the Garden between Kansas State and Michigan. After dispatching a really good Delaware team with difficulty, the Wildcats get to throw down with a top five team on national television in perhaps the most historic venue in basketball. Tell us, guys. How do you feel? “We’re privileged to be playing in Madison Square Garden… We came here to prove a point, me and my teammates and our coaching staff. We’re just ready to play,” guard Angel Rodriguez told The Wichita Eagle. If Kansas State wins, it’ll be near impossible to leave this team out of the Top 25. After Maryland and Rutgers announced their departures from the ACC to the Big Ten earlier this week, it started up the whole Realignment Apocalypse firestorm again. Kill us now. According to the Lawrence Journal-World, there’s some sort of rumor the Big Ten might now try to complete its conference by adding North Carolina and Kansas. That’s a rumor Bill Self laughed off immediately. “I don’t even think that’s worth discussing,” he told the paper, adding that the idea of North Carolina playing in a conference without Duke “makes no sense.” Which is hilarious, because Kansas and Missouri no longer play in the same conference either. There’s no Marcus Smart or Le’Bryan Nash in this class, but Oklahoma State officially announced its 2013-14 recruiting class on Thursday. It ain’t bad. Headlined by four-star Detrick Mostella, Travis Ford signed four prospects with some size (relative to their positions) and promise to them. Mostella, a 6’3” combo guard with major potential, might be the centerpiece, but Jeffrey Carroll and Leyton Hammonds are both solid wings who might be able to make up for the expected loss of Smart and Nash (whenever that may be). Ford also added some much-needed size with 6’10” juco center Gary Gaskins. This article’s a little old, and it’s the 800th story written about the tragic situation former Kansas forward Thomas Robinson faced, but it’s worth your time. Very well-written, and unique compared to some of the other pieces on Robinson. He may not play for the Jayhawks anymore, but as his NBA career begins to soar, it’s always nice to keep an eye on a guy like this. This time our interview subject is Clark Kellogg. Most of you probably just know Clark from his work at CBS first as a studio analyst, but eventually as their lead college basketball analyst during March Madness. While that is impressive by itself, just saying that would be selling Clark’s on-court accomplishments short. Clark was a McDonald’s All-American, All-Big Ten, and was the #8 overall pick in the 1982 NBA Draft. In his rookie year, he averaged a ridiculous 20.1 points and 10.6 rebounds per game while being named All-Rookie First Team, but his career was cut short due to knee injuries. Clark joined us to talk about the new season of college basketball and his association with the Capital One Cup. Kevin Doyle: How long have you been with the Capital One Cup and, in your opinion, what does the Cup stand for? 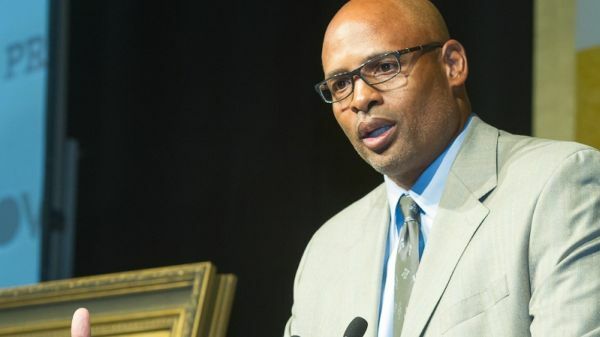 Clark Kellogg: This is year three for the Capital One Cup and my involvement as an advisory board member. To me, when you look at what the Capital One Cup represents—recognizing the top Division I athletic program on the men’s and women’s side over 39 total sports for cumulative on-field performance—the recognition not only comes in the reward of a Capital One Cup trophy, but also in $400,000 in total scholarship money for student-athletes. This combines the best of both worlds. Recognition for on-field and on-court performance, as well as supporting academic pursuits and achievement; I don’t know if you can get any better than that. The way the sports are recognized and the point system is tallied, there is a premium for winning national championships, but a school gains points for finishing in the top 10 in the end of season polls for the respective sports. So, there is yearlong involvement and opportunity to earn those points from the fall sports season through the spring sports season. When you are able to combine recognizing excellence for on-field and on-court performance with supporting and fueling academic pursuits and scholarship, that speaks volumes. KD: The Capital One Cup is so unique because it doesn’t place a premium on one sport versus another. We see in the national media football and basketball primarily takes precedence, but the Cup doesn’t favor any sports. How much does a school’s success in the Capital One Cup standings speak to the strength of their programs across the board? CK: The points you just made are good ones because all sports are involved, and men’s and women’s sports are of complete equal value to each other. The fact that you separate and have recognition for a winner on the men’s side in Division I athletics over multiple sports, and one on the women’s side is fantastic because all of those student-athletes get a chance to contribute to their program and school. This is what makes it so unique and comprehensive in its approach. I love the fact that student-athletes who sometimes don’t get the same recognition that high-profile and revenue-generating sports do have a chance to feel like they’re contributing to something that’s bigger than themselves. And away we go, headfirst into another season heralded by our 2012-13 edition of Thirty Reasons We Love College Basketball, our annual compendium of YouTube clips from the previous season 100% guaranteed to make you wish games were starting tonight. We’ve captured here what we believe were the most compelling moments from last season, some of which will bring back the goosebumps and others of which will leave you shaking your head. Enjoy! 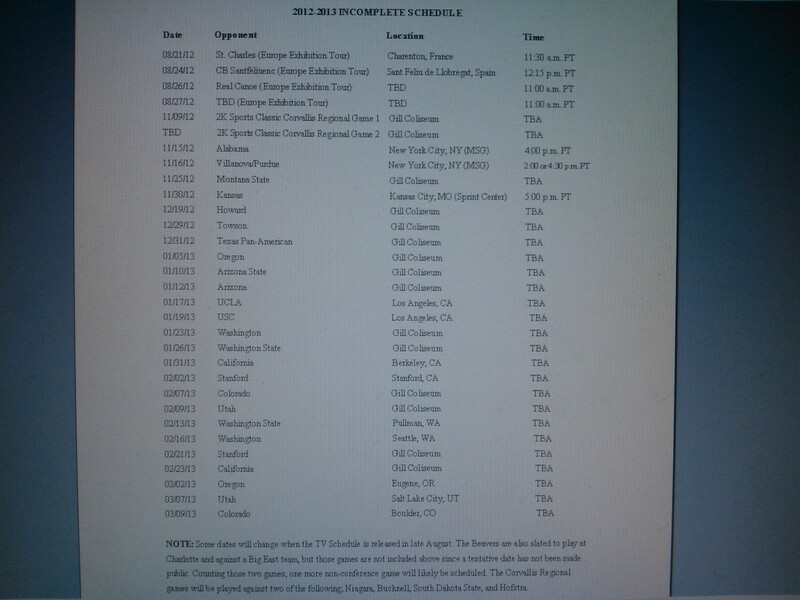 Oregon State’s schedule for next season has yet to be released, but through past contracts and other team’s schedule releases, we’ve been able to piece together most of it. There are still times and television schedules that need to get cleared up, but for the most part we now know its opponents. Below, we’ll highlight a handful of games and stretches of the season that could determine the eventual fate of the 2012-13 Beavers. For the purpose of this exercise, we won’t speculate and include games that haven’t been given a date yet. Early-Season Tournament: While we don’t know Oregon State’s exact opponents for the 2K Sports Classic Regional Round, they will face two of the following – Niagara, Bucknell, South Dakota State, and Hofstra. The Beavers should win both games no matter who they face, but all four opponents won’t be pushovers. Once they make the trek across the country to New York City, things become much more interesting. They’ll open the elimination portion of the tournament with a Alabama team that loses its top two scorers from a year ago before facing either Villanova or Purdue in the next game. In an effort to remind you that college basketball does in fact exist during the summer, Big 12 microsite writers Danny Spewak (@dspewak) and Jeremy Pfingsten (@jeremylp21) will roll out three summer updates per week during the next month. The goal is to compile every bit of news and information from the summer months for each team and package it into neat, easy-to-read capsules for your convenience. Next on the list– Danny’s update on Kansas. Fresh off a Final Four appearance and an eighth-straight season with a shared or outright Big 12 title, life is good for Bill Self. In June, he watched the Sacramento Kings draft his star forward Thomas Robinson with the fourth overall pick, and he saw Tyshawn Taylor selected in the second round. It was a banner night for his program. Plus, to help reload after the loss of those two stars and others, he made a few late additions to his 2012 freshman class by signing Milton Doyle and Anrio Adams. So all is great in Lawrence, Kansas — for the most part. There is a small developing scandal right now after prosecutors claimed an alleged drug deal gave pot to some members of the 2010-11 squad. Nobody’s talking yet, but this is a story that could drag out for awhile and may not have any immediate (or significant) effects. Still, it’s probably not the kind of thing Self envisioned himself talking about in the summer months after nearly winning a National Championship. Summer Orientation: Self’s freshman class grew in numbers this summer after the signing of Doyle, a 6’4″ combo guard out of Chicago, and Adams, a 6’3″ guard from Seattle, Washington. They’re both solid additions to this six-man class, but everybody’s waiting to see how five-star stud Perry Ellis fares as a freshman. Ellis arrived in Lawrence in early June, and he’s already acclimating himself on campus by attending children’s camps and rooming with walk-on Evan Manning (Danny’s son, of course). Power forward Zach Peters is also getting used to life as a Jayhawk. He and Elijah Johnson attended a camp at nearby Washburn, and he was quoted as saying he’s already indoctrinated into the culture of Kansas basketball. The other guy in this class to keep an eye on is Andrew White, a big-time wing from Virginia. He accompanied teammates, too, at a camp for kids. If you haven’t noticed, camps are a theme for KU this summer. The fullest summer scouting report available belongs to another player in this freshman class– big man Landen Lucas. 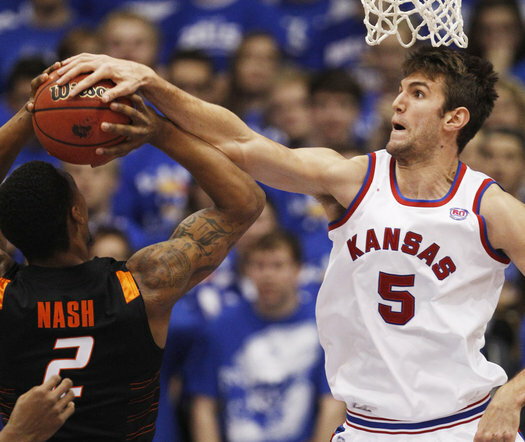 According to Jeff Withey, Lucas has already impressed him in workouts with his ability to run the floor and rebound. Also, stuck in that gray area between “newcomer” and “returnee” are two players: Jamari Traylor and Ben McLemore, who both sat out last year because of eligibility issues. McLemore has already made an impression on Bill Self this summer, whereas one writer says it’s “conceivable Traylor could have the biggest impact” of any KU newcomer. As he points out, though, closed practices haven’t allowed us to get a great glimpse just yet.